A recent report showed that suicides among our active duty troops doubled in one month, with 12 suicides in June and 26 in July. Every 36 hours a veteran from Iraq or Afganistan kills themselves. 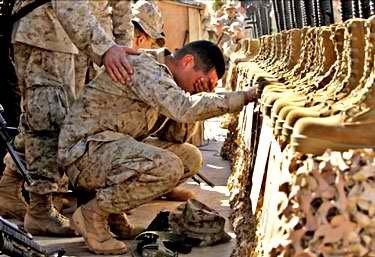 Eighteen veterans from all wars commit suicide each day. Marguerite Guzmán Bouvard, author of numerous books, including The Invisible Wounds of War: Coming Home from Iraq and Afghanistan, and resident scholar at the Women’s Studies Research Center at Brandeis University, previously professor of political science and creative writing.